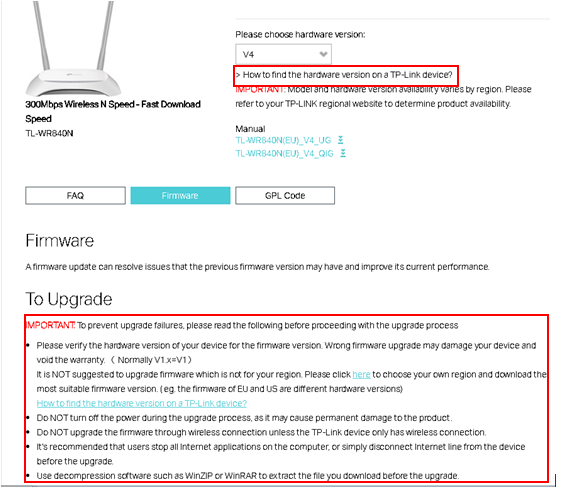 How to Upgrade the Firmware on the TP-Link Wi-Fi Routers (New Logo)? a. How to log in to the web-based interface of Wi-Fi Routers (new logo)? b. How to log in to the web-based interface of Wi-Fi Routers (new logo)? Go to Advanced > System Tools > Firmware Upgrade. Focus on the Device Information section. Make sure the downloaded firmware file is matched with the Hardware Version. Focus on the Manual Upgrade section. Click Browse to locate the downloaded new firmware file, and click Upgrade. Wait a few minutes for the upgrade and reboot to complete.